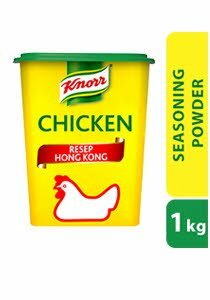 Knorr Chicken Seasoning Powder Hong Kong Recipe is made with quality real chicken meat that adds well-balanced chicken umami and aroma to all your dishes. Preferred by Chefs who wants to bring out the natural and authentic taste of Chinese dishes, it is perfect for use in stir-fry, soup and marinade. Salt, Maltodextrine, Flavour Enhancer Monosodium Glutamate, corn starch, chicken meat (4%) (contains antioxidant TBHQ), sugar, chicken flavour (contains egg, antioxidant ascorbic acid), chicken fat (1.1%) (contains antioxidant BHA&Propyl Galate), Hydrolyzed Vegetable Protein (contains soy, colorant caramel clas III), flavour enhancer sodium inosynate and guanylate, white pepper powder.